There are only few days until the most awaited Feast by the people from Catania: the Feast of St. Agatha, the third most important religious feast is just around the corner. Every year in Catania the festival takes place from 3th to 5th February, on the 12th February on the occasion of the ottava (the eight day after the Feast), and on the 17th August. The most important recurrence is certainly in February, since it recalls the martyrdom of the young Agatha, which took place on February 5th, 251 AD. For us from Catania, this is not just a simple patronal festival among many or a simple annual popular celebration… both for the devotees and for the simple spectators, the Feast of Saint Agatha is something unique, something memorable. Catania stops for 3 days, to admire and to devote entirely to its Patron Saint. And for those who can not go to the historic center to follow the celebration from the beginning, there are 24-hour local TV broadcasts following the devotees and the path of the Saint. Years go by, but the importance of this festival never passes for people from Catania and it is never taken for granted. On the contrary, the devotees try to make improvements and changes every: a bigger candlemas, a more significant small sacrifice in honour of the Saint, or different gifts. 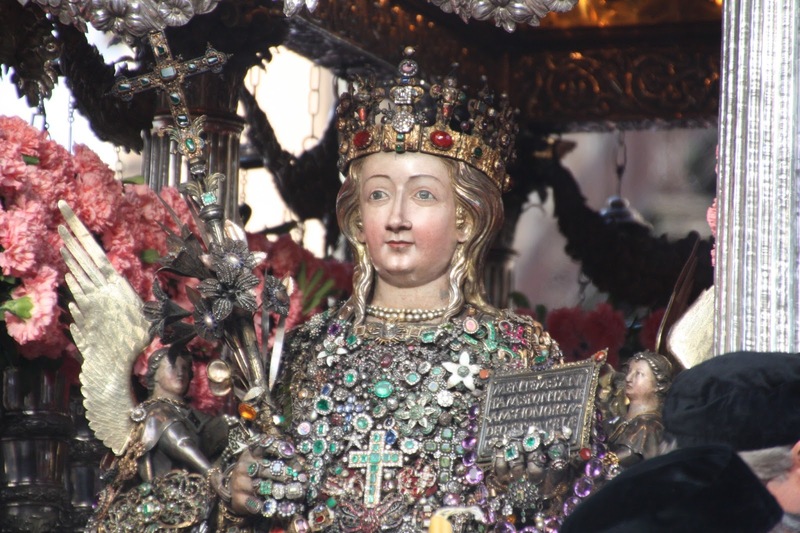 For its folkloric atmosphere, which goes between the sacred and the profane, and for its worldwide importance, the Feast of St. Agatha every year attracts thousands of visitors from all over Sicily, from all over Italy, but also from around the world! Agatha was a young patrician woman who lived in Catania, during the third century. Since she was part of an aristocratic family, the Roman governor Quinzian decided to marry her. Agatha, however, was very religious and devoted her life to Christianity, so she was not interested. After a lot of refusals, Agatha left Catania and went to Palermo to escape from Quinzian, but the Roman governor managed to find her. At the umpteenth refusal of the young woman, Quinzian started persecuting her, as she was a Christian. The Romans tortured and martered her. Agatha died on 5th February, but before her death she suffered numerous rapes. According to popular legend, both her breasts were uprooted, but the breasts regrow thanks to a miracle. From this legend, there is now the tradition of the minnuzze of Sant’Agata, which are nothing more than the Sicilian cassatelle: they are sweets made of ricotta, typical of the Feast’s period. According to the tradition, the people of Catania began to worship Agatha the year after her death: in fact, the origins of this festival are really ancient. The great celebrations in honor of St. Agatha are opened on the 3rd February, on the occasion of the parade of the Carriage of the Senate. 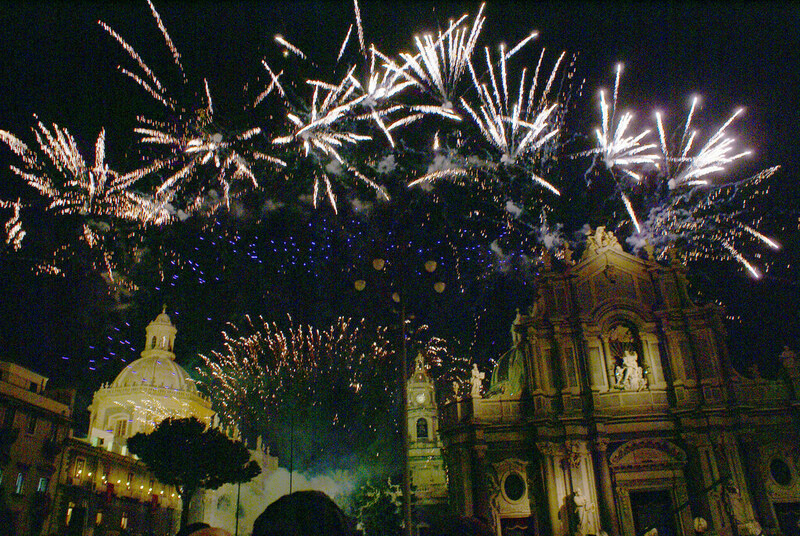 From the 3rd to the 6th February, the city of Catania celebrates the Saint: music, colors, candles, lights, cheerfulness, devotion, folklore, emotion and a lot of people around the patron Saint gather in an unmistakable atmosphere that we, from Catania, know well. On the 3rd February, after the parade of the eighteenth-century carriage through the city center, there are the magnificent fireworks in Piazza Duomo, which give a great show during the evening: a very important tradition for we from Catania, even if this means having to queue in the square several hours before, in order to fully enjoy the magic of the fires. On the 4th February all the devotees, who wear the traditional sack, and citizens can meet the Saint, from the early hours of the morning. 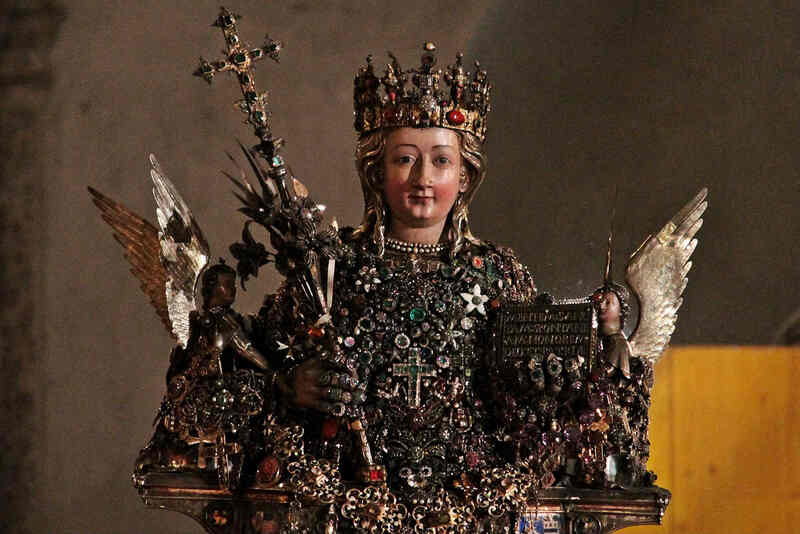 The statue that contains the Holy Relics of the Patron Saint of Catania, is carried through the streets of the city center, in a journey that represents the martyrdom of the saint. On the 5th February, there is the most awaited moment of the whole festival and, perhaps even the most feared one: the ascent of Via San Giuliano. The statue is carried by the devotees along this route, characteristic for being a very steep street. This courage test may indicate a good omen for the current year. Finally, the 6th February the statue of Saint Agatha reaches Via Crociferi, where the cloistered nuns of the San Benedetto Church pay homage to the Saint with their songs. All the festivals in Catania are surrounded by typical sweets and could not be otherwise for the most important festival of Catania! In addition to the already mentioned minnuzze of Sant’Agata, during the celebration it is usual to taste good nougat with hazelnuts, or the typical olivette of Saint Agatha, green almond paste sweets, which recall just the olives. According to tradition, during his escape from Quinzian, in front of Agata a majestic olive tree appeared by a miracle: today this miracle is honoured, in fact, with the olivettes of Sant’Agata. 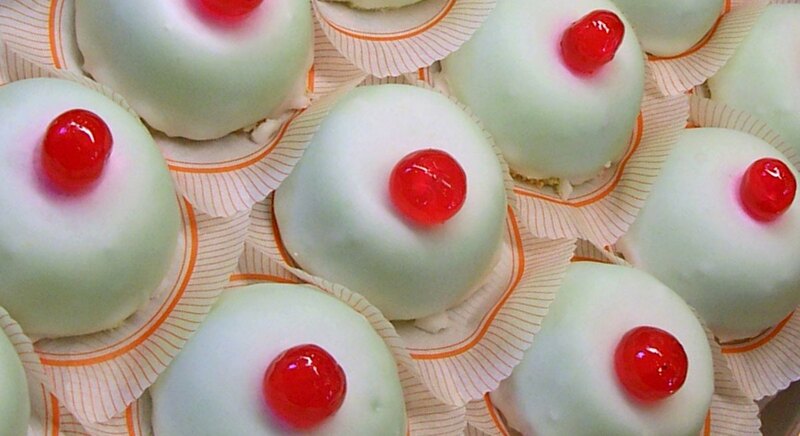 The Feast of Saint Agatha is one of those events that is worth knowing and admiring live, at least once in your life. To fully experience the magic of this festival, of world importance, between devotion and modernity, between sweets and joy, contact us for transfer services to and from Catania.